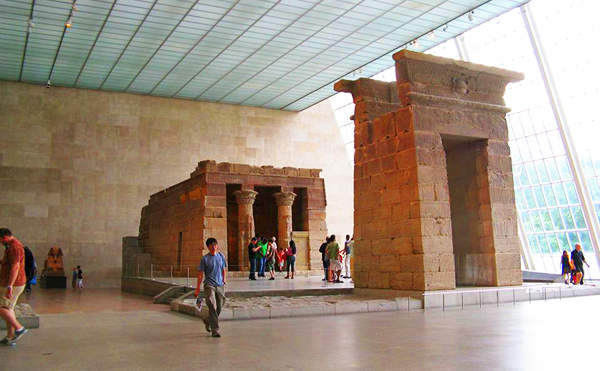 The Met’s Sackler Wing houses the Temple of Dendur Yair Haklai. Their family’s support “began decades before the opioid crisis” says president and CEO Daniel Weiss. The Metropolitan Museum of Art in New York is re-assessing its gift acceptance policy in light of the ongoing controversy involving the Sackler family, long-time donors to the museum, and the financial ties of some members of the family to the sale of the opioid OxyContin. Museums and cultural institutions in the US and the UK, including the Met, Tate and the Serpentine Galleries, continue to face scrutiny over sponsorship by the US family, whose fortune comes from the pharmaceuticals company Purdue Pharma, which was purchased and built up by the late brothers Raymond, Mortimer and Arthur Sackler. The company makes the drug OxyContin, which has fed into the deadly opioid crisis. Last week, the City of New York added eight members of the Sackler family who serve on the board of directors of Purdue Pharma and related entities, or have served since OxyContin was introduced in 1995, all widows and descendants of Raymond Sackler and Mortimer Sackler, to a $500m lawsuit filed last year to offset costs related to the opioid crisis. These include Mortimer’s widow, Theresa Sackler, who has made donations to the Victoria and Albert Museum (V&A), the Serpentine Gallery and the Tate in London. New court filings in the state of Massachusetts—which last June, launched the first lawsuit to name individual Sackler family members as defendants—show internal communications including a message in which Richard Sackler, the son of Raymond Sackler (named in both the Massachusetts and New York lawsuits), tells sales representatives to push for doctors to prescribe the highest dosage of OxyContin, since that is the most profitable, the New York Times reports. The Met’s Sackler Wing, which houses the Temple of Dendur and opened in 1978, was funded by Arthur, Raymond and Mortimer Sackler. The artist Nan Goldin and her activist group PAIN staged a protest in the wing last March. After the protest, Arthur Sackler’s widow, Jillian Sackler, responded in a statement that her husband “died [in 1987] nearly a decade before Purdue Pharma—owned by the families of Mortimer and Raymond Sackler (his brothers)—developed and marketed OxyContin”. Mortimer (who died in 2010) and Raymond Sackler (who died in 2017) were involved in the company’s launch of the drug in 1995. “None of the charitable donations made by Arthur prior to his death, nor that I made on his behalf after his death, were funded by the production, distribution or sale of OxyContin or other revenue from Purdue Pharma. Period,” Jillian Sackler said. The gifts she mentioned in the statement include the Met’s Arthur M. Sackler Gallery of Chinese Stone Sculpture, which opened in 1965. Arthur Sackler’s widow and children, including Elizabeth Sackler, who has funded projects such as the Elizabeth A. Sackler Center for Feminist Art at the Brooklyn Museum, are not named in the lawsuits.